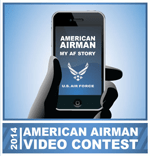 The finalists for this year’s American Airman Video Contest tell stories from Alabama to Australia to Afghanistan. They are medical sonographers, security forces airmen, cyber systems operators, musicians and EOD technicians. The Air Force, which on July 1 called for short “selfie” videos from airmen, has whittled down the entries to 13 finalists. You can vote for your favorite through Aug. 22. “Every Airman has a story — and smartphone technology now allows those Airmen to share those stories with a wider audience than ever before,” Air Force Chief of Staff Gen. Mark A. Welsh III said in a statement. The airmen who made the cut include an airman first class at Kadena Air Base, Japan, who went from delivering pizzas to “drilling holes in multi-million-dollar aircraft” and a cyber systems operator and “aspiring writer” from Maxwell-Gunter Air Force Base, Alabama, who tells his story in rhyme. “It takes a special kind of crazy to do what I do,” he says. Some of the videos are simple. Some are productions set to music. They range from silly — an EOD tech who says he joined the Air Force for a “legal means to blow stuff up” — to serious — a dog handler who was nearly discharged early on in his career but went on to become a war hero. The video that receives the most “likes” will be featured at the Air Force Association’s Air and Space Conference and Technology Exposition at National Harbor, Maryland. Senior Airman Michael Muck, an explosive ordnance disposal technician assigned to the 341st Civil Engineer Squadron at Malmstrom Air Force Base, Montana. Airman 1st Class Kyle Gott, an aircraft structural maintainer assigned to the 18th Maintenance Group at Kadena Air Base, Japan. Senior Airman Valerie Lloyd, a broadcast journalist assigned to the 1st Combat Camera Squadron at Joint Base Charleston, South Carolina. Tech. Sgt. Brian Williams, a security forces defender assigned to the 87th Security Forces Squadron at Joint Base McGuire-Dix-Lakehurst, New Jersey. Tech. Sgt. Cable Rose, a professional military education instructor assigned to the Training and Education Center at McGhee-Tyson Air National Guard Base, Tennessee. Staff Sgt. Wesley Wilkins, a fuels technician assigned to the 940th Logistics Readiness Squadron at Beale Air Force Base, California. Senior Airman John Kaczmar, an audio engineer assigned to the United States Air Force Band of the West at Joint Base San Antonio-Lackland, Texas. Senior Airman Brett Walters, cyber systems operator, Air Force Life Cycle Management Center, Maxwell-Gunter Air Force Base, Alabama. Senior Airman Nolan Payne, an emergency management technician assigned to the 27th Civil Engineer Squadron at Cannon Air Force Base, New Mexico. Staff Sgt. Jose Diaz, a supply technician from the 633rd Logistics Readiness Squadron in Joint Base Langley-Eustis, Virginia. Senior Airman Kevin Larkins, a seismic maintenance technician assigned to the Air Force Technical Applications Center: Detachment 421, Alice Springs, Australia. Staff Sgt. Ashlyn Marra, a diagnostic medical sonographer assigned to the 48th Medical Group at Royal Air Force Lakenheath, England. Tech. Sgt. Matthew Garrett, a photojournalist assigned to the 455th Air Expeditionary Wing at Bagram Air Field, Afghanistan.